I had worked up this pattern in the usual way, with a chain and loved it. 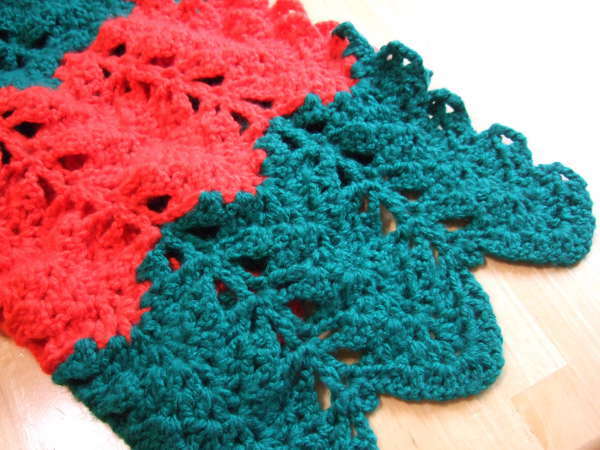 Then I learned about your no-chain patterns and was hoping to find the Lacy V-stich Ripple, and there it is! Thanks again, your patterns are beautiful. Well, I started the No Begnning Chain Lacy Ripple and am having trouble understanding the first part of the 3rd row, it doesn’t see to line up! Is there a tutorial on this pattern, or perhaps a chart? In my experience the shells should line up and if I skip the first v in line two it throws it off. I am so sorry about that. You are correct. I had the wrong directions for the shell. I have corrected it now. In studying the original pattern, with a starting chain, I noticed that the directions for the shell stitch are different! could this be the problem? If so I will correct in the next row and not skip the first v in this pattern. HELP! AI NEED TO GET THIS GOING AS A GIFT FOR MY GRAND-AUGHTER. Yes, you are right. The shell should have been like the directions in the original pattern. I’m so sorry for the mistake. Yes. I corrected it in the pattern. The problem was in the description in special stitches of the shell. It was from another one of my patterns and I missed changing it. Thanks for responding! I have ripped out my 2nd row and am starting again. I’m using a soft worsted weight yarn with an I hook,and it looks great. Thanks again, can’t wait to share the no chain patterns with a church needle work group. The v-stitches are made in consecutive chain spaces. The shells are always done with dc stitches. In the directions when you refer to chain space in the second row it means the center of the oval openings right? It doesn’t mean each individual chain that was done does it? I looked at the picture at the top of page but I must be misinterpreting the directions. You are correct. It is the ovals you created in the first row, not the individual chains. Love your no chain starting technique. What a marvelous idea. Technique. I have made several of them already and today I’m looking for two more. Thank you so much for your time and effort on these patterns and tutorials. Can’t wait for some new afghan / blankets patterns. On row 3 the first shell, is it over the skipped chain? The shells will all go in the center spaces of the shells of the prior row. V-stitches will go in the side spaces of the prior row shells. V-stitches will go in the v-stitches closest to the shells of the prior row. The V-stitches farthest from the shells on the prior row are skipped. “Row 2: Ch 4. Without turning the work, v-stitch in first ch sp, v-stitch in next ch sp, shell in next ch sp, (v-stitch in next ch sp) twice”. What exactly do I do twice? Just what’s in parenthesis or everything up to the the word “twice”? I am doing the blanket that’s done with a first row of chain and tr spaces. So should I have a tr space instead of the v stitch left over at the end? Or did I miss-read the spaces? Thank You so much. I figured out row 2 once I saw the visual diagram you sent to someone in another comment.I reinterpreted the directions to be “just in parenthesis” (one v stitch in each of the next two chain spaces). This makes more sense because while I did it with the (tr chain space)to start row one with, it matches with the diagram you posted for the chain space version..for the Lacy Ripple blanket.Thank you for being so kind and patient. Sorry for so many posts. The No Beginning Chain Lacy V-stitch Ripple Afghan; it’s going to be lovely. I have completed the first three rows but am stymied on how to finish row 3. It says to end on next to last v-stitch but does not tell me how to end the row. I still have the remains v-stitch and chain 4 from row 2 to address to obtain an even edge. What do I do to finish off the row correctly? You don’t use those stitches. Just turn and continue with the next row. The edge will also have a bit of a ripple instead of being straight. I will be adding a sentence to make that more clear. Sorry about the confusion. I ran across your pattern and loved it until I noticed there is no “Row 3″ instructions. I would love to demonstrate this pattern at the museum I volunteer at. Please email me the instructions for Row 3. Many thanks. There is definitely a row 3. Did you print it or create a pdf? If you use the icon at the top of the page to do those and accidentally click a section it is deleted from your print or pdf. How many repeats of rows 3 and 4 do you do to achieve the blanket sizes listed. Another question: in row 4, after the V stitch I. The chain 4 (loop) space, shouldn’t there be another chain 2 before making the next V stitch to even the space? There aren’t any ch 2’s on row 4. Where it says “Skip next v-stitch and chain 2″ that is saying to skip both the v-stitch and the chain 2 from the prior row.